Handmade in Britain by the renowned supplier Duresta striving to provide the ultimate in comfort and durability in living room furniture, the Hornblower 3 seater sofa combines the finest manufacturing skills with the best materials available to produce long lasting sumptuously comfortable sofa. Elegantly styled with a traditional design, the Hornblower 3 seater sofa boasts beautifully proportioned piece of furniture with slightly curved arms, elegant tassle tie backs and finials to add a vintage feel to the modern day home. Frames are made from selected hardwoods, each dowelled, glued and screwed for trouble free long life, with coil sprung seating and serpentine sprung back for durability and comfort. 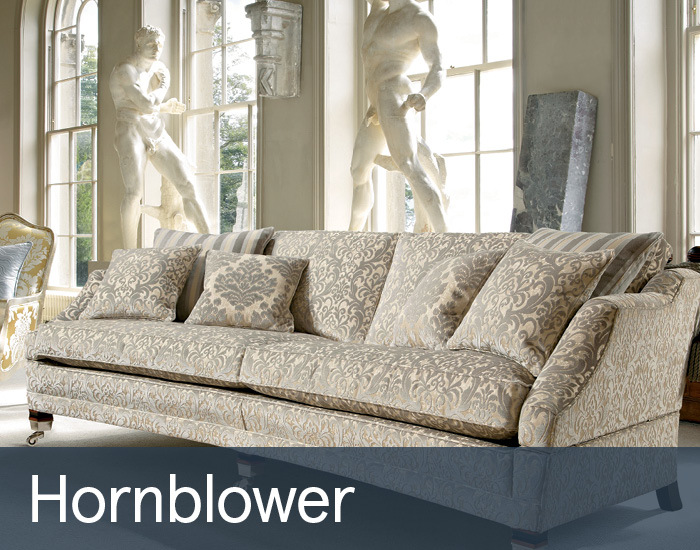 With an extensive selection of luxurious fabrics in varying patterns and colours, the Hornblower sofa is sure to enhance the style and character of your living room. Crafted with a durable hardwood frame the Hornblower makes an exemplar of quality sofas, and with antique wood and brass metal finished castor legs help make them practical for moving in and out of the home. These legs are available in a range of colours, with or without castors for your preference. Choose the Hornblower 3 seater sofa and match it with the Horatio chair and footstool to complete the look.